Falling For YA: Vote For The Darkling! Today is the Day! 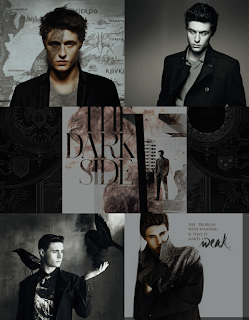 Head over to YA Sisterhood and VOTE for the Darkling!! Update 6/18: WE WON!! The Darkling is now headed to Round 2 on July 1st against Perry! Oh my dear Darkling you didn’t ask for my flattery but I’m going to freely give it. Of all the YA bad boys out there you take the cake. You truly are the villain we love to love! He may not be natural but he is hot! Strong jaw line, eyes like granite, and he’s constantly wearing black clothes with his symbol, the sliver of a moon during an eclipse. Maybe that is the reason we swoon over The Darkling? Because like calls to like. We see something in him that is reflected in ourselves. Those dark thoughts that creep in to your soul at night, the loneliness that overtakes when we are truly alone, the longing to change the world for good or better, to leave a mark. The Darkling feels those same things. I knew he was a practiced liar. He could fake any emotion, play on any human failing. But I couldn’t deny what I’d felt in Novyi Zem or the truth of what the Darkling had shown me: my own sadness, my own longing, reflected back to me in his bleak gray eyes. The Darkling is the leader of the Second Army. He is second only to the Ravkan King and he views the King as nothing more then a child. The Darkling is the most powerful Grisha and he knows it. The Darkling isn’t afraid to use his power for good…or evil…depending on your perspective. The Darkling also has a host of skills that only he possesses. He can summon darkness to blind his enemies, use darkness to slice his enemies in half (the Cut). He’s also a living amplifier which means that his power can be used to strengthen the power of other Grisha. The Darkling is someone you want to have on your side in a fight! “So I'm the Darkling's prisoner?" Why should you vote for the Darkling? ♥ He is the villain we love to love! wow! who is this handsome!! Voted :) Even though I'm not as familiar with The Darkling as I should be. I'd love to win the second book since I recently bought the first one. Would you stop by my blog? I'm from Puerto Rico and my friend and I are promoting our blog. There are so many things I love about the Darkling!!! He is hot and mysterious. Even though hes the villain he I still hope he wind the girl!! !